next March 25, 2015 4:30 p.m.
Sesame not only will open your door but, unlike most smart locks, would fit right into a Ikea showroom. As technologies go, keys have a pretty sound record. They've stood the test of time; they're relatively easy to share with a small group of people; they do their job without much hassle. 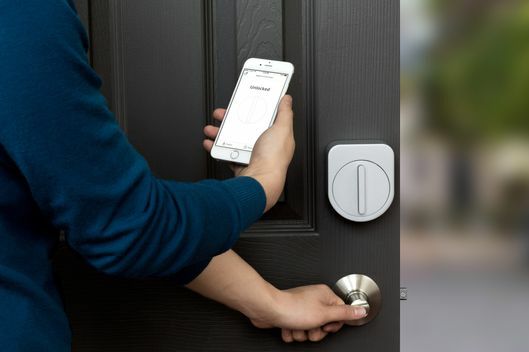 So, "smart locks," which can be opened with a phone instead of a key, have been a hard sell — especially when, at up to $250 or so apiece, they're much more expensive than a regular old deadbolt. But a small Palo Alto–based company, Candy House, has a shot at changing that. Sesame — its first product — not only will open your door but, unlike most smart locks, would fit right into a IKEA showroom. Sesame has exactly the sort of origin story you'd expect for a company that started at Stanford: Jerming Gu, a master's student, and his classmate bought a 3-D printer. "We wanted to have a cool toy," he says. They used it to build the first prototype of what would become Sesame, and started using it—and improving it. Last summer, they were using it every day, 20 times per day. At first, it failed, often. But they kept making it stronger and more robust, until the motor could stand up to their demands. Aside from its clever name and slick look, Sesame has one big advantage: easy installation. It fits over five different types of deadbolts and, since it's notably light, can be attached to the door with double-sided tape. Plus, there are all the extra advantages that keys don't give you: You can lock and unlock the door remotely to let a friend into your house, share your "key" without a getting a physical copy made, and check at any time whether you stupidly left the door unlocked. And people do actually want this: Candy House is 30 days away from the end of a Kickstarter campaign and has made it well past the initial $100,000 goal — to $750,000. That translates to more than 4,000 people willing to spend around $150 to be freed from their keys. The company has competition, too: August, which makes one of the best smart locks out there, has just raised $38 million in funding and is aiming to get its product into hardware stores within the next year. But Gu isn't tying his future to smart locks — he thinks of Candy House as a robotics company, not a smart-lock company. The long-term plan: "We think we should just make something cool for people — something useful," Gu says. What If One Shot Could Melt Away Fat?